Save yourself years of painstaking work by buying this ready made topiary specimen - already crafted by expert nurserymen to it's final shape. The perfect plant to grace a handsome pot bringing the plantsmans art to your garden to be admired for years to come. Easy to care for - just give an occasional light trim to maintain shape, taking particular care to remove shoots from any bare stems. 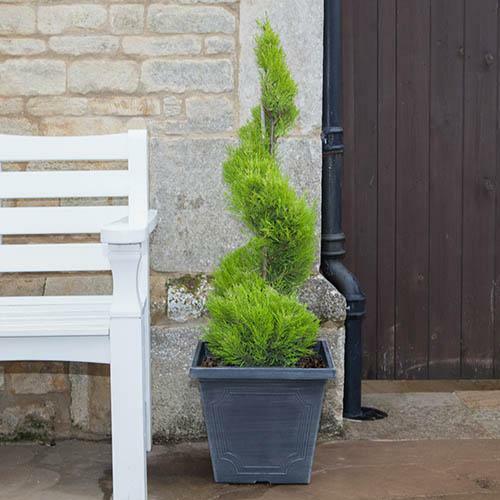 Save yourself years of painstaking work by buying this ready-made topiary specimen - already crafted by expert nurserymen to its final, attractive and attention-seeking shape! Providing instant impact, this Goldcrest Topiary specimen is the perfect plant to grace a handsome pot, bringing the plantsman’s art to your garden. Place by a doorway, gateway, pathway or by a patio for a really striking feature. Easy to care for, just give an occasional light trim to maintain shape, taking particular care to remove shoots from any bare stems. Supplied as an established plant approx. 1m tall in a 10L pot.